The Federal Aviation Administration (FAA) released a list of 149 airport control towers it says it has to close because of the sequestration budget cuts. Obviously, the FAA tried to minimize the damage by limiting the cuts to airports with low usage. 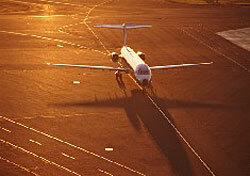 Closings at small city airports will impact travelers the most. Although these airports will remain open, responsibility for flight operations and safety will rest solely with the pilots taking off and landing. And although lack of a control tower doesn’t preclude commercial air service, it’s hard to see how it won’t affect airline decisions about whether and how often to serve these fields. The closure of a tower at Trenton Mercer could have a major impact on Frontier, for example, which had announced plans to make that airport the hub of a large eastward expansion. Branson was enjoying a growth spurt, with service by both Frontier and Southwest. Closure of the towers may well deter major airlines for expanding in these cities. It’s also very possible that airlines serving some of the smallest airports will just pull up stakes and end their flights. Closings at small airports in large metro areas will have less of an impact on commercial service. The main problem here is whether lack of control towers at small airports that are near big ones—Portland-Troutdale and Norwood (Massachusetts), for example—will cause increased risks at the adjacent big fields. Otherwise, the main burden at these fields will fall on general aviation, which is used to using uncontrolled airports routinely. The shut-down process starts on April 7. Overall, these closures will hurt service to smaller communities. How badly remains to be seen. Check here for a complete list of the airports where FAA towers will close. And keep watching to see if local political powers can force at least some of them to re-open.